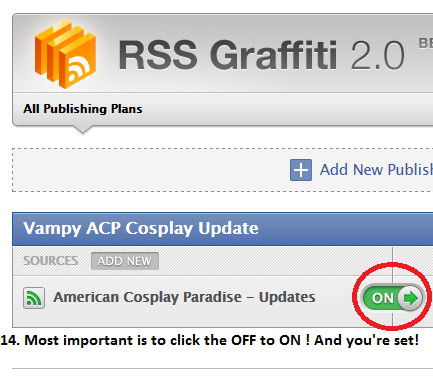 We noticed a recent epidemic in Cosplay Fan Pages on Facebook, but did you know that ACParadise can automatically publish your recent costume updates on to your shiny new FB fan page? We have the instructions handy below. Of course if you're internet-inept, you can request that Woone Kao do it for you, but you'd need to set woonekao at aim.com as admin. 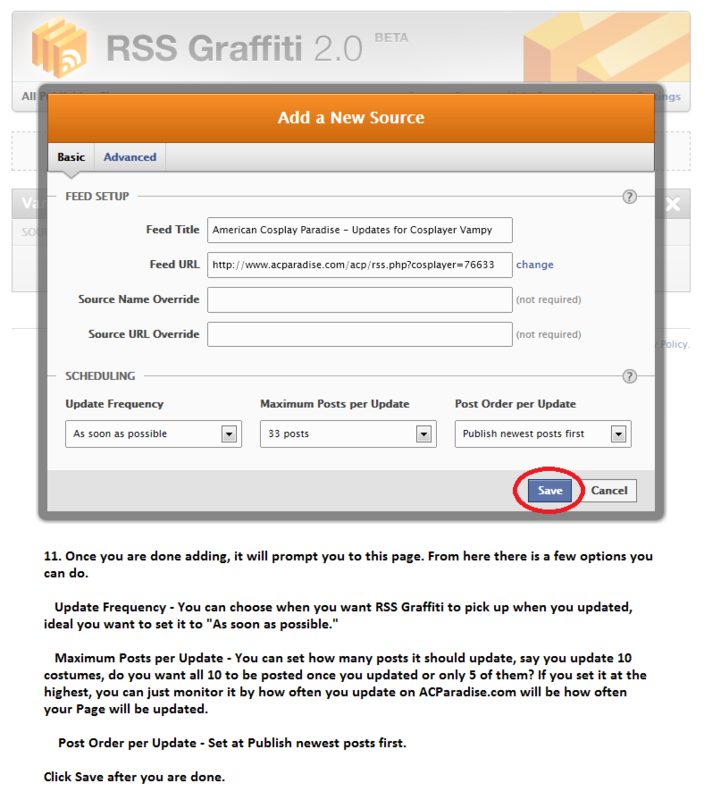 What are the benefits of RSS INTEGRATION? 1. 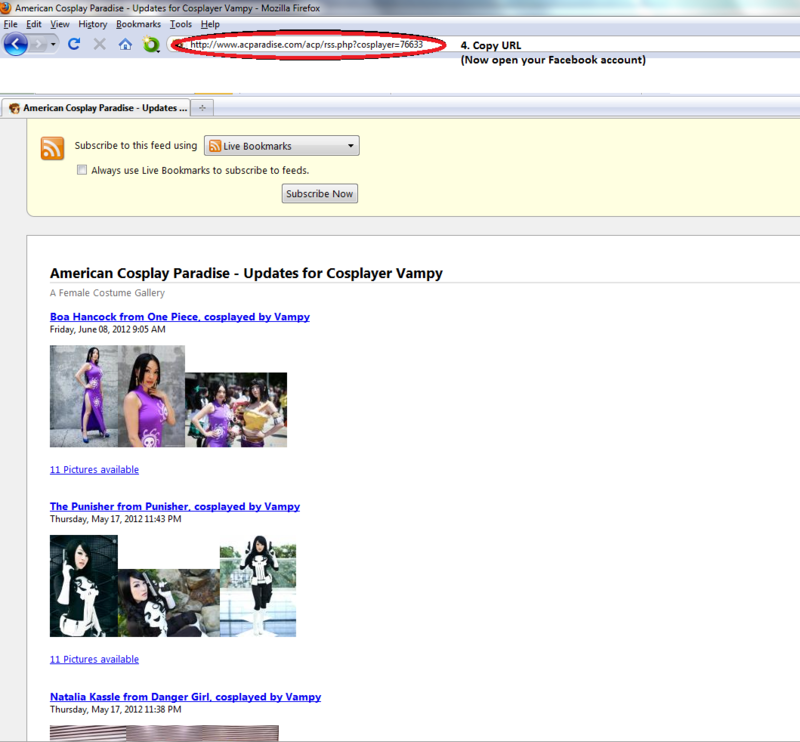 Updating ACP results in automatic updates to your Facebook (and twitter too if you joined those accounts). Get two/three for one! 3. If you are concerned about Facebook's non-exclusive, transferable, sub-licensable, royalty-free, worldwide license on your photos uploaded to your page this is a great alternative. 4. 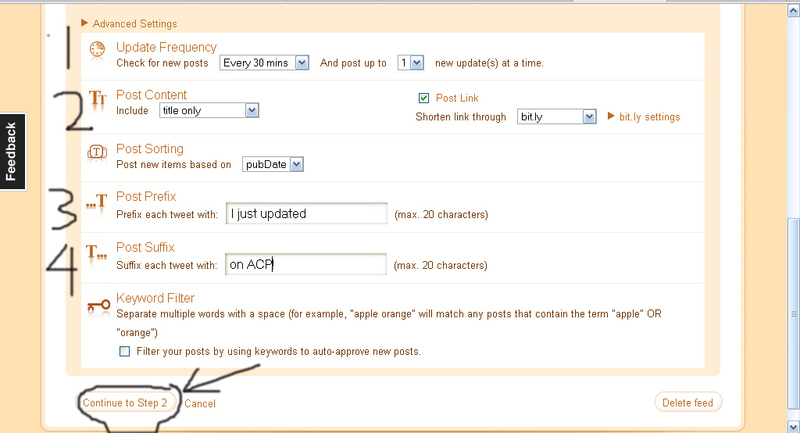 Less use of the "Share This" button on ACP as it will automatically be shared. 5. 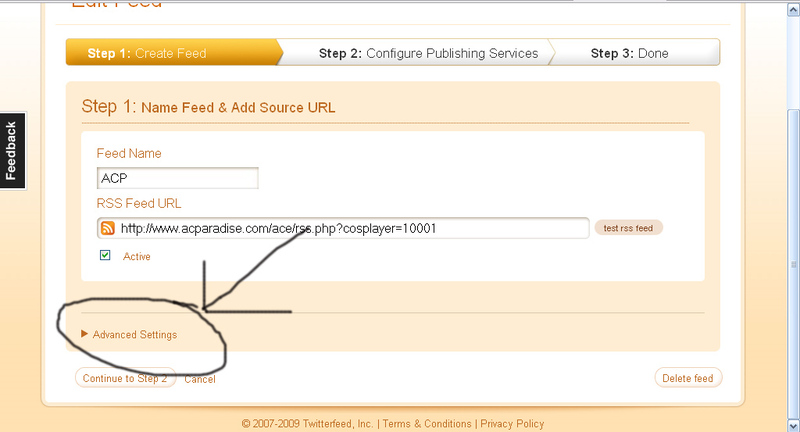 Drive traffic to your ACParadise account. 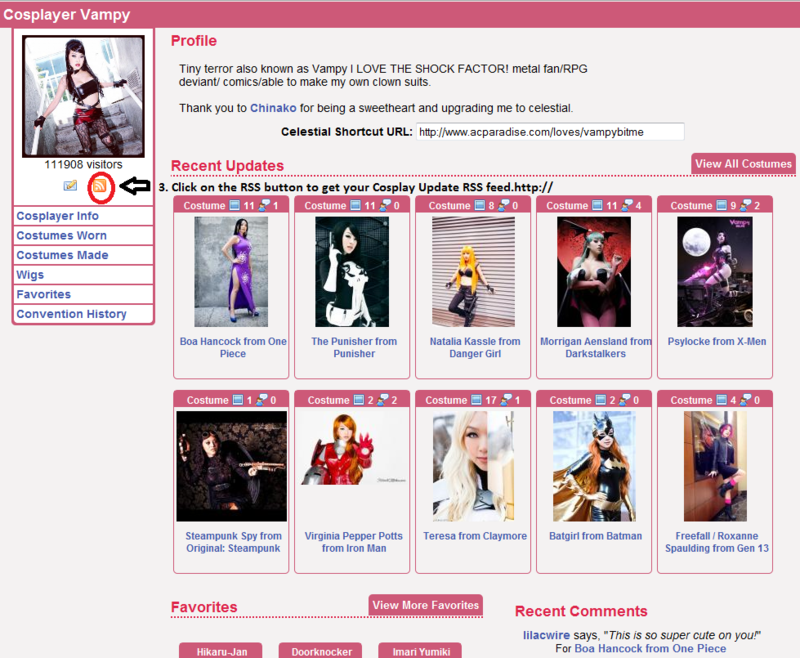 RSS stands for RSS Really Simple Stalking Syndication, and if you have an ACParadise cosplayer or photographer profile, you have a RSS code. Simply use this code on your favorite social networking site to get your cosplay updates to display automatically whenever you update your ACParadise. Say you got a twitter, livejournal, facebook, and cosplay fan page on facebook. Updating each and everyone of those with your cosplay can be a real pain. 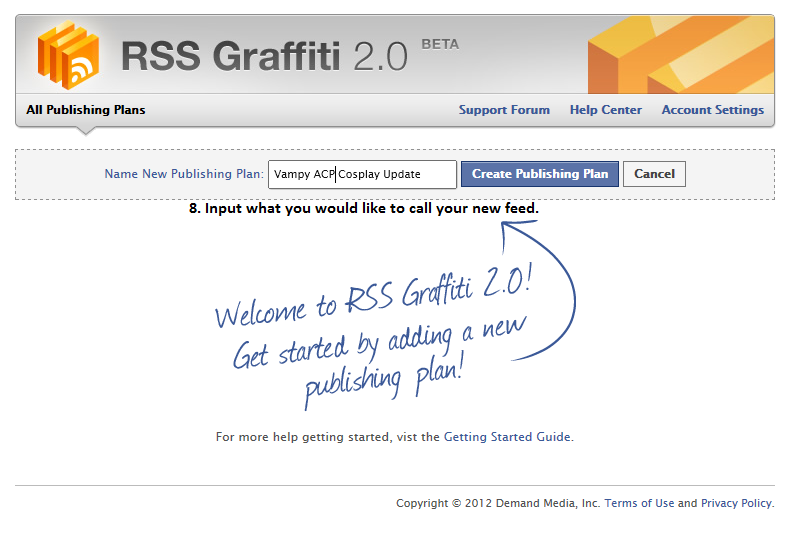 But with RSS, just by updating your ACParadise, ALL of them will get updated for you! * This is quite the ideal situation if you have cosplay specific twitters or facebooks, and want your fans to keep updated when you update your ACParadise account! 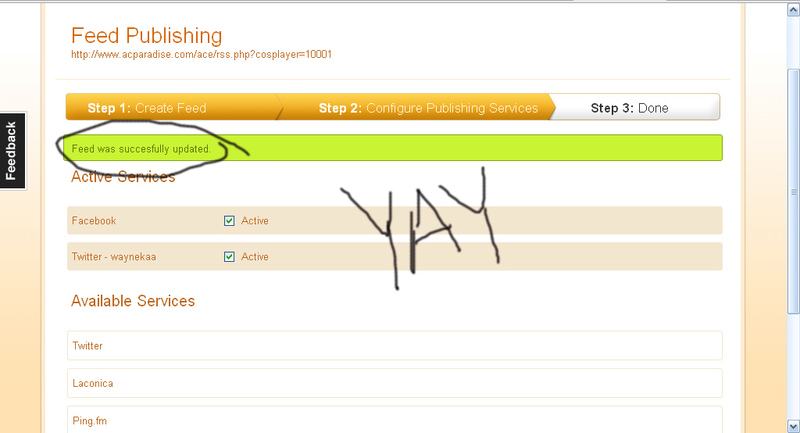 RSS is compatible with ACSnapshots accounts too! Automatically post your gallery and photoshoot updates right to your social media site! 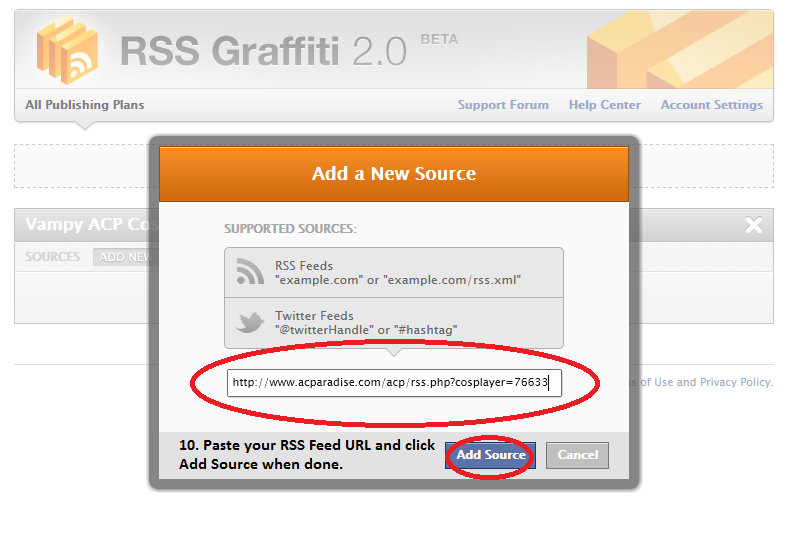 Since every social network site operates a little bit differently, scroll through the instruction set for all the details on how you can add RSS. It won't take you that long to put in, and will save you a ton of time down the line. 3. 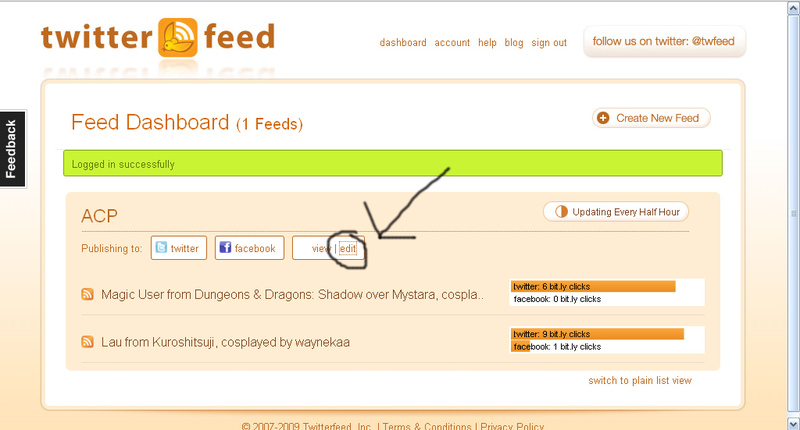 Click on the little orange RSS box on the left under your profile photo. This RSS code is what you'll be putting into each of these sites. NOTE: If this step does not work, please start over using the latest version of INTERNET EXPLORER. Known problems with Google Chrome compatibility. 6. 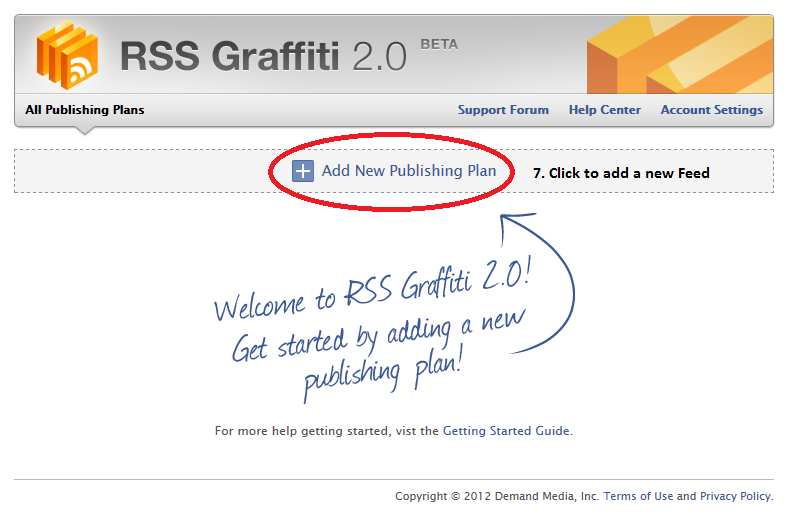 Name your RSS Plan. Your cosplay name will do. 7. Fix your desired settings, then hit Save. 7. 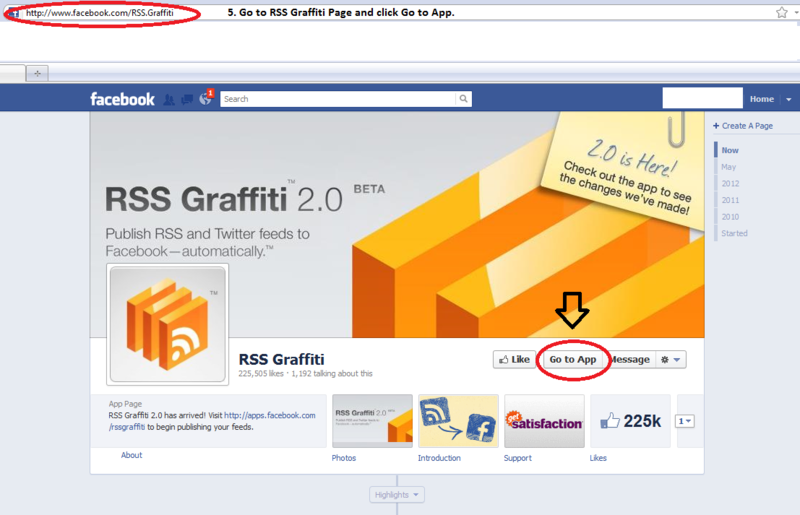 At this step you can choose to have the RSS go to your actual account or your fanpage. 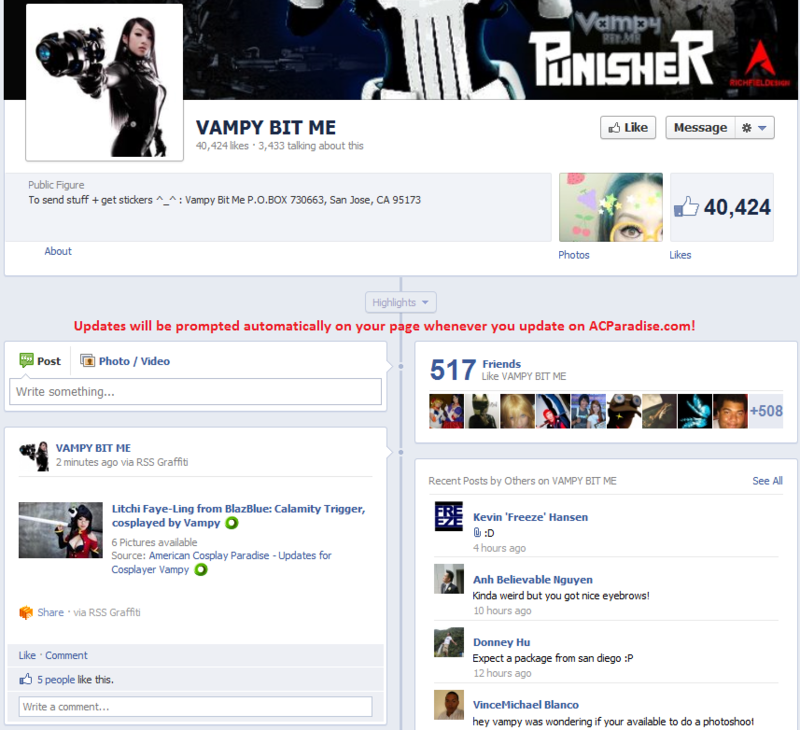 Since we're playing around with Fan Pages, make sure your Target and Publish on Behalf of are the same page. 8. Turn the darn thing ON! 9. Now you upload some new photos to ACP to test it out! 7. If desired, connect your Facebook to Twitter. Click http://www.facebook.com/twitter/ and link your FB to twitter. 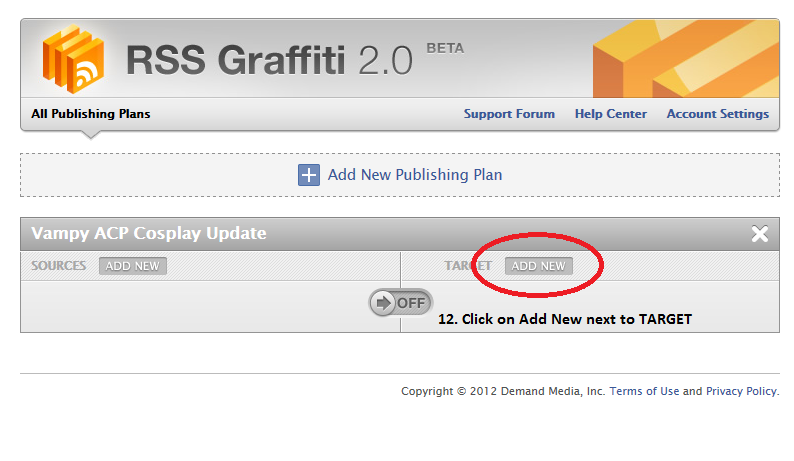 Go to RSS Graffiti and click "Edit"
Select your desired level of privacy. 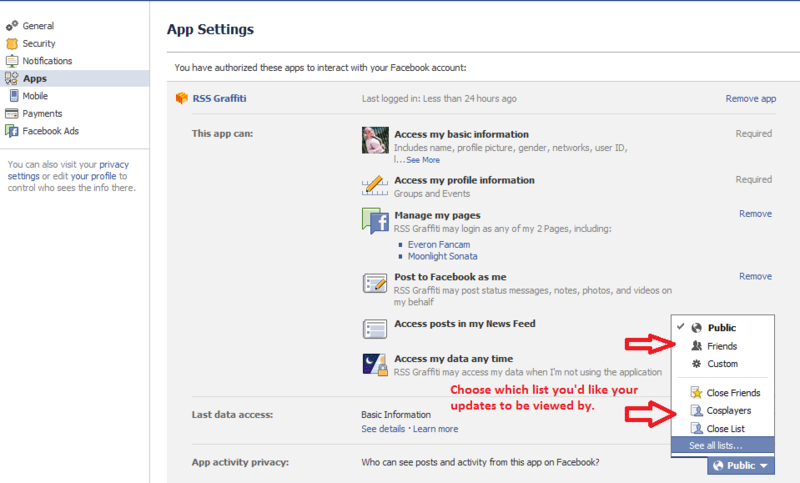 Choose "custom" to filter out certain people like relatives or coworkers if you don't want them to see your updates. Click the big blue button to authenticate it. 9. 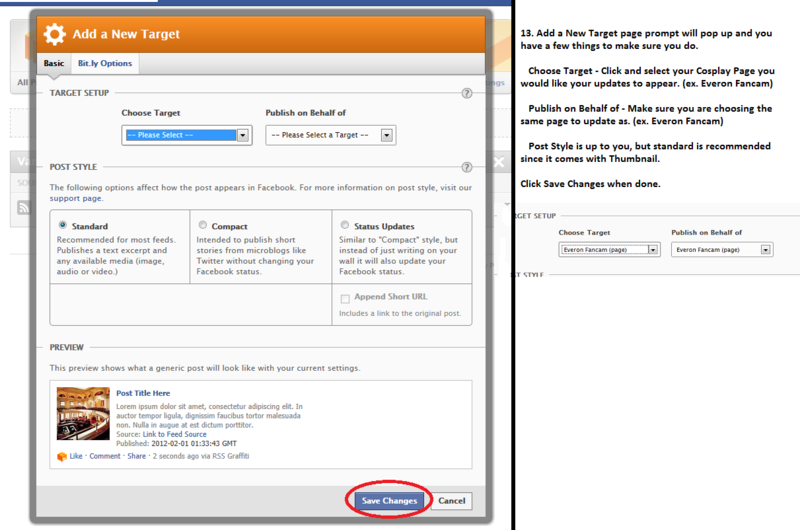 Now if you're lazy and want Twitterfeed to also manage your Facebook, follow these instructions. (Only if you didn't import it separately.) NOTE: If you use twitterfeed to import to facebook, you need to have full descriptions in order to get thumbnails. 10. 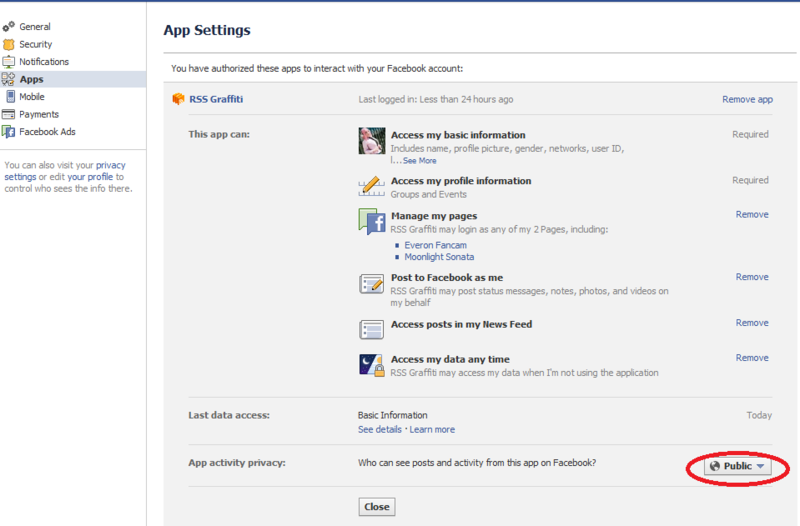 Input your Facebook log in, Authenticate and Create Service. 11. Bingo! Visit the dashboard if you wish. It'll show you how many clicks you got. -Make sure Content is set to Title + Description. -Add in a Prefix like: "I Just Updated"
-Add in a Suffix like: "on ACP!" 4. Note: You need a paid LJ account to do the initial syndication.